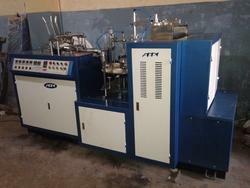 Leading Exporter of paper cup making machine and paper cup machines from Faridabad. In order to append and respond to the emerging requirements of client, we are able to offer a wide range of Double PE Coated Paper Cup Machines. This range is widely used for forming single coated and double coated paper cups. These machines offered by us provide Paper cup coating and are applauded for possessing frames and body that are made utilizing metal and steel. Along with this, the offered range is installed with ultrasonic welding as compared to original APPI-53 paper cup machine. These delhi paper cup machines are more popular especially in Delhi Region. We are offering a superior range of Paper Cup Machine that are part of our paper cup manufacturing machines. 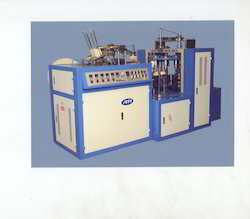 The frames of these machines are manufactured utilizing metal, sourced from reliable vendors of the market. The body of this range is manufactured utilizing steel and is well known as automatic paper cup making machine & multi-working station machines. These machines are a kind of cup machine suppliers. This range is known for operating via automatic paper feeding, sealing, oiling, bottom punching, heating, curling and cup discharge.